Sandro Botticelli (1445-1510) is one of the most well-known painters of the Italian Renaissance, famous for Birth of Venus and Primavera. This piece is an illustration of the Hell described in Dante's Divine Comedy. Both Dante and Botticelli were from Florence, and there was a particular revival of interest in Dante in late fourteenth-century Florence.This was one of many illustrations Botticelli created to accompany a publication of Dante (ninety-two parchments have been found) and is exceptionally faithful to the text of Inferno. This map is incredibly intricate and detailed, with each of the nine layers differentiated. The piece also includes several specific episodes of Dante's journey, such as his meeting with Francesca da Remini and her lover Paolo in the second circle, and his encounter with the Minotaur. 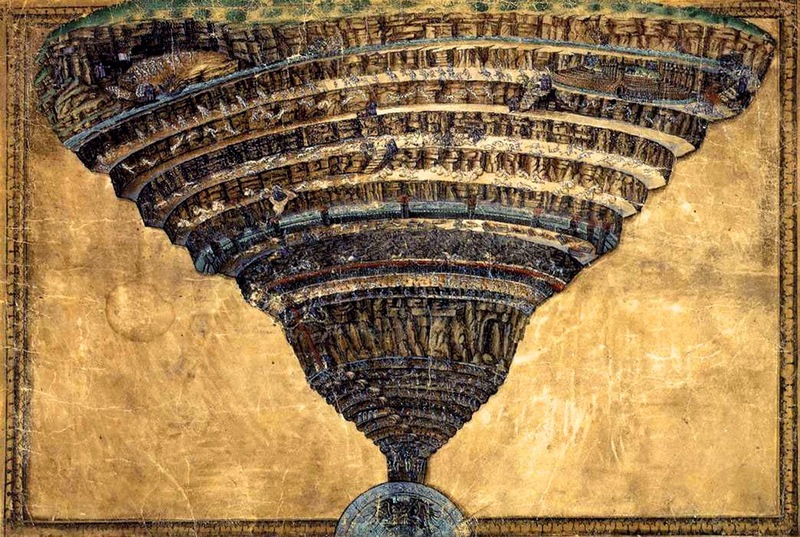 An interesting aspect of the map is that it does not depict Hell at a particular moment, but instead is a continuous representation of Dante's descent with Virgil. From their time in the Green Meadow to their final descent into lowest Cocytus, Dante and Virgil appear several times throughout the map. This piece is an amazing representation of Dante's poem as well as a fascinating and masterfully complex image in and of itself. There is an interactive map here that points out some of the specific episodes depicted.